This is just a mashup of The Kitchn's How To Make a Single Rice Krispies Treat and smitten kitchen's salted brown butter crispy treats, written all together so I don't have to straddle two recipes: maximum efficiency so that I can make these in the shortest time possible, soon I will have this memorized. I have very limited patience for making non-essential food, and yet really like a) salted things, b) brown butter, and c) rice krispies treats. 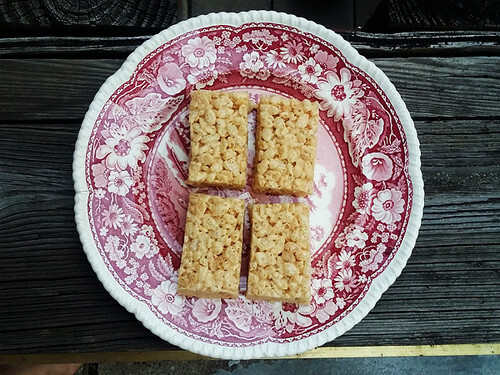 I have also historically had zero patience for making rice krispies treats because I couldn't even with wrestling that whole mass into a pan and getting it stuck to my handsghghghghgh. Making a single treat is so genius in this regard, though: I can show a single treat who's boss. Buttered hands and parchment paper help, too. And why even bother dirtying another pan, amirite. Melt the butter in a small saucepan over medium-low heat. Stir constantly, until you start to see tiny brown grains forming in the melted butter. Keep stirring and cooking just a bit longer, but not too much longer or else you will burn the butter. Remove from heat and stir in the marshmallows until they are melted and smooth. Add the rice krispies and the salt, and stir until the rice krispies are well-coated with melted marshmallows.